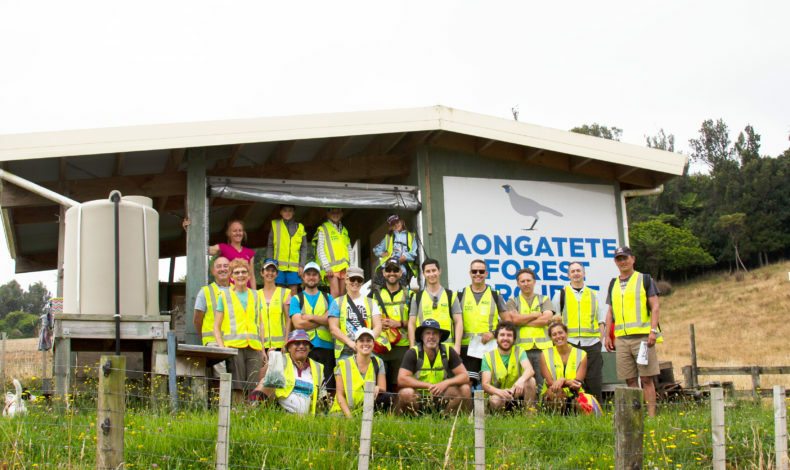 The Tauranga office team left their desks and computers behind, and headed out to spend the day getting hands-on in the forest. Aongatete Forest Project (AFP) is restoring 500 hectares in the Kaimai Mamaku Forest Park, between Tauranga and Katikati. The project was initiated by Forest and Bird, Katikati Rotary and Ngai Tamawhariua, who have the kaitiaki role over the forest. The project is administered by the Aongatete Forest Restoration Trust in partnership with Forest and Bird, and operates under the supervision of the Department of Conservation, who administer the Park. The aim of the project is to restore the wildlife and plant life to a part of the Park, to demonstrate the value that widespread pest control could deliver for the region. With maps in hand and dressed in hi-vis vests, teams of two set off into the bush, accompanied by Millie, the DOC rat detector dog. Each pair was given a specific area to work in, going off-track to put rat bait blocks into the bait stations in the northern area of the AFP. After four to five hours the group had replenished around 250-280 bait stations. Louise Saunders said the AFP team were grateful for the support of people younger than their usual volunteers, as this meant more trap lines could be completed in far less time than usual. The next AFP volunteer day will focus on other tasks like checking tracking tunnels, stoat traps and possum traps. Our Tauranga team enjoyed being in a beautiful forest on a sunny day, having some team-building time with great conversations and learning along the way; and were happy to have helped not only the environment, but the community. The day was topped off with some taking a dip at the water hole.